You can create playlists combining images and movies and save them to an SD card. You can then insert the SD card into the projector and select the playlist you want to project. 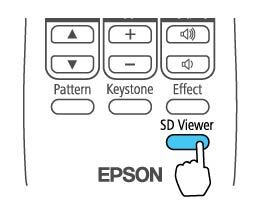 Note: See the Epson Projector Content Manager Operation Guide for information about creating playlists and exporting them to an SD card. 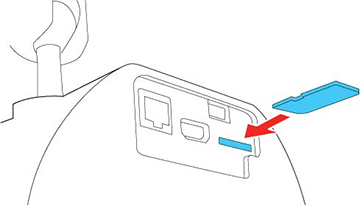 Insert an SD card containing content playlists into the projector's SD card slot. Press the SD button on the projector's remote control to project the playlist on the SD card that was played last. If there is a timetable assigned, the playlist will play back according to the schedule in the timetable. 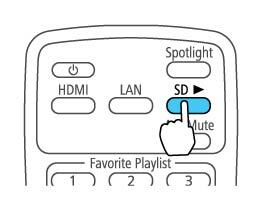 Press the SD Viewer button on the projector's remote control and use the arrow buttons to select a playlist from the displayed list. 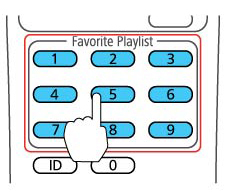 Start a specific playlist assigned to a favorite playlist's button by pressing the corresponding number button on the projector's remote control. 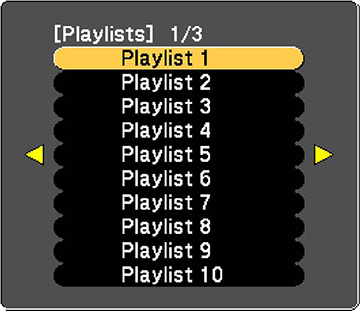 Note: You can assign playlists to each of the number buttons (1 to 9) on the projector's remote control using the Epson Projector Content Manager software. See the Epson Projector Content Manager Operation Guide for details.